Eureka Physical Therapy in Eureka, California and Deborah Crowley founder of FlexEffect conduct an independent study of the effects of Facialbuilding. Under the direction of Deborah Crowley a panel of healthy females (average age 45) trained daily for a period of two weeks in Facial Resistance Training™ ‘FlexEffect’ The results showed and average 35% increase in facial muscle strength. 100% of the panelists reported an increase in facial firmness. FlexEffect Facialbulding is a new approach in the recover of Bell Palsy. Now being offered at Mad River Hospital in Arcata CA. Dr. Gary L. Grove, Ph.D.
An independent study consisting of a panel of healthy older females with some signs of facial laxity followed a mechanically aided facial exercise program based on progressive resistance for 3 months. Dr. Gary L. Grove, Ph.D., conducted the study at the Skin Study Center in Broomall, PA, a well-known and highly regarded research facility utilized by many of the world’s top cosmetic companies. By the end of the 3-month treatment period, highly significant differences were achieved. The scientifically monitored changes in the panelist’s facial structure were quite consistent with the primary perception of the panelists that their facial skin had become firmer and more elastic. The overall pattern of change also corresponded nicely to changes in the condition of their facial muscles as measured by the time they could hold a high resistance load. The data collected during this study clearly indicates that dynamic constant external resistance exercise performed twice daily with a resistance exercise device can noticeably improve facial muscle strength and decrease skin laxity. It was found, however, that not everybody benefits to the same extent or in the same way. Those who appear to need the most rehabilitation, with the “saggiest” skin obtain the greatest improvement. In general, E. R. Buskirk, author of Handbook of the Biology of Aging, concludes that physical alterations effected by regular exercise blunts the downward trend commonly associated with aging. The results of Dr. Grove’s study strongly suggest that this is true for the cutaneous muscles responsible for facial expression as well. Other workers, most notably Morikawa and Nakamura, authors of Cutaneous Aging referring to the muscles in facial expression, also feel that the various patterns of wrinkles and slacks that characteristically occur at different again stages can be directly related to specific facial muscles. Their view of the Japanese literature on this topic reveals that several groups have reported that programmed expressional exercise will improve facial appearance. They also point out that strong motivation and patience are required to achieve effective results, and this is clearly the case with a progressive resistance device. However, if faithfully followed, a dynamic constant external resistance exercise program is an effective rehabilitation therapy for persons experiencing facial weakness and sagging skin. Background: The highly active antiretroviral therapy (HAART) is effective, but lipodistrophy (LD), mainly from face, is an adverse event that interferes with the self-esteem and the adherence to treatment. As there is no treatment available for that condition, we study a muscular facial hypertrophy to fill the space left from the fat wasting. Methods: We accompanied 6 male patients, with age ranging from 34 to 57 years, 2 with mild, 2 with moderate and 2 with severe LD. Their time on antiretroviral therapy ranged from 2 to 7 years. The time of LD appearance was difficult to ascertain. To study the improvement in LD we made a protocol based on the phonological evaluation of the subjects, that included suction, mastication, deglutition and respiration, besides to the bio-mechanical alignment of phonological organs (lips, tongue, cheeks, mandibles, soft and hard palate and teeth). Each patient had a picture taken on resting facial position and smiling, before and 3 months after starting treatment. We used the orofacial mio-functional therapy to strength the facial muscles, working out cheeks, lips and tongue. The subjects were followed once a week for the first month by the phonologist, doing the exercises for 30 minutes 3 times a day at home. They were then followed every 2 weeks. Results: Two subjects with mild LD and 1 with severe LD had a great improvement. The other patient with severe LD was lost to follow-up. The two subjects with moderate LD remained stable. The exercises led to hypertrophy of muscles involved in the facial expression and mastication, partially filling the facial fat wasting. The willingness for improvement and the emotional status influenced the outcome. Conclusions: That kind of treatment can be used early in the care of patients on HAART, acting as a preventive tool or delaying the onset of facial LD. A phonologist, to prevent asymmetries, chewing and oral occlusion problems, must orient the patient. Pictures will be presented. Authors: Sato I. Ueno R. Sunohara M. Sato T.
Title: Quantitative morphology of dermal elastic fibers system of the human face during aging. Source: Okajimas Folia Anatomica Japonica. 74(2-3):65-73, 1997 Aug.
Human skin has various distributions and arrangements of elastic fiber (EF). Previous reports did not clearly show the distribution of elastic fiber in the face skin because of various contents during aging. In this study, a color image analyzer indicated distribution of elastic, oxytalan, and muscle fibers in human face skin. During aging the muscle fiber size and the content of the elastic fiber decreased in the modiolus and inferior labial regions of the human skin, and the ratio of the elastic fiber was lower than that of oxytalan fiber measured areas. That is, the dimension of oxytalan fiber may reflect the content of elastic fiber, and muscle has a role in the distribution of the elastic fiber in human face skin. In the deeper regions, small and large elastic fiber bundles were found near the sheath of gland and muscles. Therefore, face movement might be an important aspect to maintaining the elastic fiber content of human face skin. Tissue Engineering and Wound Healing Laboratory at Brigham and Women’s Hospital, an affiliate of Harvard Medical School; Tufts University School of Medicine; and the University of Padua, among other contributing authors. Recent studies have shown beyond doubt that bone atrophy contributes significantly to facial aging, and that gravity and repetition of facial expressions are not such important factors in the aging process and more importantly, facial exercise just might be a way to slow down the bone loss. From the Facial Nerve Center at the University of Pittsburgh Medical Center, Core Network, LLC, Department of Physical Therapy at the School of Health and Rehabilitation Sciences, the Division of Plastic, Reconstructive, and Maxillofacial Surgery, Department of Surgery, at the School of Medicine of the University of Pittsburgh. Author: Brach, Jennifer S.M.S., P.T. ; VanSwearingen, Jessie M. Ph.d.,P.T. ; Lenert, Joanne M.d. ; Johnson, Peter. M.d. Title: Facial Neuromuscular Retraining for Oral Synkinesis. The purpose of this paper is to describe the outcome of facial neuromuscular retraining for brow to oral and ocular to oral synkinesis in individuals with facial nerve disorders. Fourteen patients with unilateral facial nerve disorders and oral synkinesis who were enrolled in physical therapy for retraining were studied. Synkinesis was measured with quantitative video facial position analysis prior to the initiation of physical therapy and at regular intervals during retraining. Retraining included surface electromyography biofeedback-assisted specific strategies for facial muscle re-education and a home exercise program of specific facial movements. Twelve of 13 patients with brow to oral synkinesis and 12 of 14 patients with ocular to oral synkinesis reduced their synkinesis with retraining. Patients with 1-year or greater duration of a facial neuromuscular disorder (excluding patients with unusually marked changes) demonstrated a significant decrease in brow to oral synkinesis and in ocular to oral synkinesies; there was a mean percentage decline in abnormal movement of 60.5 percent (SD=22.48) and 30.1 percent (SD = 62.57), respectively. We conclude that brow to oral and ocular to oral synkineses associated with partial recovery from facial paralysis were reduced with facial neuromuscular retraining for individuals with facial nerve disorders. Notes: … the skin overlying the muscles that make expressions is folded virtually millions of time in our lifetime. I consider it remarkable that our skin is so durable that it can survive this with only a few wrinkles. We all smile and express ourselves at all ages of life, but it’s not until the tissues themselves are assaulted by external factors like sun-damage that these creases begin to become permanent. “…these exercises are difficult to describe but the purpose is to contract all different muscle groups in the face that you can, thus increasing their size and strength and helping to prevent facial sagging. STAY YOUTHFUL AND FIT A Doctor’s Guide. “As a Scientist in the field of aging reversal and skin remodelling, I personally want to congratulate Deborah Crowley on her design and development of what she coined in 1979, Facialbuilding. 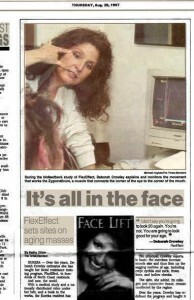 Her non-surgical Program “FlexEffect” has literally revolutionized Facial Reconstruction Alternatives. “…I needed an exercise program to recommend to my patients and my internet search produced eight of them. Deb’s FlexEffect was the program with the best strength training focus. Combining her bodybuilding expertise with a thorough knowledge of facial musculature, she has developed a program that makes sense physiologically. From a scientific standpoint, facial exercises unquestionably work. Much as an applied program of bodybuilding strengthens and enlarges the skeletal muscles, as well as tone and tighten the overlying skin, facial exercises do the same. The skin and muscles in the face sag with time. A regular applied program of facial exercise will strengthen and lift them, and tone and tighten the overlying skin as well. “It’s refreshing to finally come across a facial exercise program (FlexEffect) that not only can improve muscle tone but also actually increase muscle mass. It is a well-known fact that as we age, we gradually loose skeletal muscle mass. Researchers are finding that most of this wasting as we age can be prevented or reversed by exercising the involved muscles. after approximately thirty years of age our muscle mass and strength gradually decline. In order to keep this disuse atrophy (muscle wasting) at bay it is necessary to exercise the skeletal muscles, Unfortunately, facial muscles are skeletal muscles that are rarely exercised to any significant extend. Also with age the skin gradually losses blood vessels, dermal collagen, fat and elastic fibers. It’s no wonder then that with aging we begin to have hollow cheeks, jowls, droopy eyelids, bags under our eyes etc. While reading about the FlexEffect program and browsing the discussion board, I have noticed several references to the smooth skin of children compared to that of the sun damaged, aging skin of adults. The reason kids can make thousands of expressions that do not result in wrinkles is not because of a lack of sun damage. The epidermis of a newborn continuously grows to accommodate new growth in both musculature and skeletal structure. Gerontologists have conclusively proven that this growth can occur from birth to about twenty-five years of age, after which the human body slowly begins to decline. At that point, when the epidermis is no longer growing and stretching, is when the ravages of gravity and sun damage begin to take effect. This is exactly when a program like FlexEffect is most beneficial. Through facial resistance training, a person is able to increase muscle mass, thus causing the epidermis to stretch and reduce the appearance of wrinkles. Thank you for your time and I look forward to joining you all as a facialbuilder. Former President of the California Academy of Cosmetic Surgeons. “When you exercise, you tone and tighten the muscles in your body, so why not apply the same principles to your face? I’ve seen the results, and it works.